“Competition has always done things in a certain way and companies just follow suit believing in the very safe methods of obtaining the cheapest, quickest route to a lucrative bottom line. You may need to try the Blue Ocean Strategy which would no doubt require more risks but bold steps to bring bigger revenue“.  Youth today, adult tomorrow, where would it have lead you.  Most of you will in a few years’ time, have reflected on where time has gone and what you have achieved.  Are you willing to go the extra mile?  Failure of the educational system to educate and equip the youth of this generation in comparison to their counterparts in other parts of the world.  The issue unemployment after graduation still remains a challenge for the Government.  When we do not adopt and adapt best practices or, when we do not plan appropriately, we are definitely preparing to fail. Greetings and standing on all protocols. I will relay these practices to my life and mention how some of them have helped to shape, mould and bring me to where I am today. Generally, best practices, must be able to be measured, replicated and considered successful otherwise, they are of no use. You must have read and learnt about best practices in business in the past, so I will only dwell on the most important ones, and some of which helped me. However, in doing so, I will focus on the new wave and methods to drive businesses as well as using networking tools.  Strategy and Marketing methods: Competition has always done things in a certain way and companies just follow suit believing in the very safe methods of obtaining the cheapest, quickest route to a lucrative bottom line. You may need to try the Blue Ocean Strategy which would no doubt require more risks but bold steps to bring bigger revenue. o BLUE OCEAN STRATEGY by W.Chan Kim and Renee Mauborgne – Basically, this highly acclaimed strategy which advices eliminating competition by making them irrelevant. It is a matter of being innovative enough to provide the public with new ways of giving them value. Such are termed ‘value innovation’ unleash new demand. So don’t join competition, forget the fight for competition advantage, battle the market share and the struggle for differentiation. Create some new innovative ideas or products that are new to industry standards. Get out and think out of the box!! o About 45 years ago, I was as young as many of you are here. I have made a number of choices as an entrepreneur, some of which you will hear about, the choices you will make will differ BUT have to be made before you can get a break! o I have learnt a lot over the years about business, leadership requirements, personal development and relationships. Being called an entrepreneur is the easy part!  A definition of an entrepreneur is “‘someone who starts a business or organization’ – anyone here can do that correct?  But it is the success of that business that will be crucial – ask yourself will that business stand the test of time?  Will it eventually feed your family?  Will it educate your children?  Will it sustain you in your latter years?  Will it grow to be an empire or conglomerate?  Will it even last 6 months let alone 6 years or go on for generations? So what are the perceptions of the Nigerian Youth Today?  Many do not want to work hard or even understand the concept of hard work as they crave overnight success dropping onto their laps! Therefore I can tell you from MY experience as an entrepreneur, if you are a youth who operates like this, the chances of being an extremely successful entrepreneur are slim OR as our American bothers/sisters say “It just ain’t gonna happen!! So what are some of the right tools?  Integrity (no compromise of standards and be known for it). o With the invasion on technology, people can work smart and can achieve outstanding performance!  Perseverance (Never give up!) Today’s world enjoys electricity because of those who did not give up. o First Impressions: The way you appear speaks volumes not only about your person but also, about your company. Wearing the wrong clothes at the right time could portray you and your company in bad light, no matter how knowledgeable you may be. o Communication skills: Be a good Listener, communication is a two-way method of conversation and should not be over-bearing or one sided. So, develop good listening skills. A British bank used to refer to itself as “the listening bank” and the slogan actually endeared the public towards it. o A firm handshake and eye contact are considered to portray confidence. The ability to hold intelligent conversation and be professional make room for a lasting positive impression. o Training: Proficiency and efficiency calls for training in any professional endeavor. Acquire skills and be properly groomed. I have had cause to attend many training programmes in different parts of the world to sharpen my skills and fill in gaps where I believed I had needs or just to fine- tune. Some of these were mini MBA courses, leadership skills, negotiations, owner/manager business courses and lately, public speaking. It is all part of personal development.  Appoint mentors: Surround yourself with successful people. Appoint mentors whose lives and ideologies you admire, who can build you up with their wealth of experience. It would have taken them years to get to where they are and they are usually willing and feel honoured when appointed for such mentorship roles, especially when the requests come from youths. One young lady I have become quite attached to and who I continue to encourage is Miss Toyosi Akerele from Nigeria. She in turn mentors thousands of youths and was recently invited by Mrs. Michelle Obama to the White House for a programme where she represented Africa.  Build Relationships: The two most important relationships in life are with God and with family. God expects us to come to Him who is our loving Father who nurtures, guides and guards His Children. We too should do the same with our families, bringing us peace of mind to enable us excel in business. o What are the threats – are you aware and taken necessary steps to address them?  Networking on-line – male and female. Using social media sites like Facebook, linked-in, twitter, instagram etc. Do something new and post it on all these sites. You may want to begin with a well structured and informative website. The reality of the moment is such that if you are not connected via the Internet the world will pass you by. Let social media do the leg work for you by taking advantage of all of them as face to face traditional networking cannot take you very far. Some people and companies have millions of followers. If you don’t do it, others will do it for you in an inappropriate manner, including impersonation. I experienced that until I put up my personal website recently. I found that though I am the one and only Folorunso Alakija, in the whole wide world, yet many people had impersonated me and fed the public with lies. So, I implore you, don’t get left behind.  Target Audience: As you try to network, decide on who your audience should be and consider how you can leverage on opportunities they can bring to the table or how they could be useful in opening new frontiers for your line of business. Make the right moves, introductions and invitations for cocktails or entertainment to break any ice. Don’t ever part without leaving informative materials with your new contacts. However, a quick follow-up by email confirms seriousness of purpose. Every social, family, religious, sports, or gender related event is an opportunity to network, meet new people and get friends to link you. Take it, use it and develop it.  Be Selective: Decide on your purpose and plan towards it. Choose the appropriate events you should attend that will enhance your vision and the social media where you need to have a presence. Careful planning brings awesome results. For instance, I have set up a committee to evaluate my invitations, and determine those that fall in line with my calling and vision and fit them into my itinerary. One of such is today’s gathering.  Don’t Discriminate: By all means, never look down on anyone and don’t judge a book by its cover or you can make very serious mistakes or get a rude shock. One woman who shocked the entire world had entered into a singing contest called Britain’s Got Talent. She looked unexciting and rather drab in her dressing and her overall appearance and age was certainly not on her side, But, the minute she opened her mouth to sing, the entire audience watching via television from all over the world, got the biggest shock of their lives. She gave them all what I would refer to as “a wakeup call” as if she was saying: “I can do this and you don’t have a choice but to reckon with me and judge me by my content and not my looks. Her name is Susan Boyle and she finished in second place that night, had over 12,000 u-tube hits within minutes, but her winning song became the title of her debut album which became UK’s best selling debut album of all time. Within 9 days, videos of her had been watched over one hundred million times. From then on, her life changed. She has received huge publicity, been invited to take part in many very important programmes, met with the high and mighty in the world and told her own story which I believe must be inspiring others within and outside her industry.  Round Pegs in Round holes: When we fail to carefully select our staff for certain positions but do so from our emotions, empathy or because he or she is a relation, the company’s bottom-line could be seriously affected. Ignorance and wrong attitudes are bred and in-efficiency and chain breaks set the company back. The constant struggle to move the company forward can certainly do without unnecessary distractions. o Appearance (Are you always presentably dressed, clean and smart?). o Dexterity (Are you mentally and physically skilful? Do you think and act quickly and cleverly). o Character (The combination of qualities or features that distinguishes a person, group, or thing from another). What distinguishes you that would get people endeared to you?  Be submissive – accept or yield to a superior force or to the authority or will of another person i.e. : God, Parents, Teachers and Government. o Be a trailblazer! Do not go where the path may lead, go instead where there is no path and leave a trail!!! o Wisdom: Through wisdom a house is built and by understanding it is established Proverbs 24:3 (Meaning: When homes are built on godly wisdom, family members respond to circumstance according to God’s design, not their own. A wise home builder recognizes God as the Architect and Builder of the family. When you have God’s perspective of your mate and children, you accept each other’s differences and learn how different personalities can complement each other). o Have Faith: God is faithful. Never mind about those who tell you to leave God out of your business. Business is God’s business. The bible says He is the one who teaches us to make wealth. Rely on Him as it says in Prov. 3:5-6, “Trust in the Lord with all your heart, and lean not on your own understanding. In all your ways, acknowledge Him and He will direct your paths.” Don’t let anyone mislead you. My covenant at the time was that if the Lord would bless me, I would work for Him all the days of my life. He did not let me down. o LEADERSHIP: Good leadership qualities will empower and impact your business positively. o A leader is a visionary who can drive a mission by successfully carrying others along to achieve the aims and objectives of that mission within the required time frame. o No matter how we define a leader, it is obvious that the person is at the helm of affairs and the decisions he or she takes can and will affect the organization positively or negatively. o It is therefore pertinent for a leader to have the skills necessary to succeed. Some people are born to lead and others acquire the skills to lead. All are permissible and the tools are the same and the results are appreciable. o Leadership calls for certain values and principles to be in place. Taking the right decisions at the right time is crucial and personal development is a must. I come from a polygamous muslim family of 52 children and eight wives from Ikorodu town in Lagos State. I am 63 years old and married and blessed with four grown up gentlemen and grand children. o At 63, I am not yet done so what is your excuse!? o Many believe that the lack of money is a problem and that money is the answer – myth! o Many think that if they do not have a family member or friend who gives them financial assistance that they cannot ‘make it’ as Nigerians say! – Myth again! o Being a successful entrepreneur will take hard work, enthusiasm, patience, diligence, adopt best practice principles, professionalism and ethical principles all rolled into one – so what is YOUR agenda? o Are you ready to put these best practices into becoming an outstanding entrepreneur? o I am glad that the UN have recognized such a day where we salute all 3.1billion of you – we appreciate you. o Get educated, so that you can mentor others of the importance of education. o Personally, I do not have a university degree BUT the best values and practices are some of the skills which I have told you about today and which have got me where I am today. o SO for those here, consider yourselves lucky and take full advantage of the opportunity you have here,. Thank you for listening God bless you all. 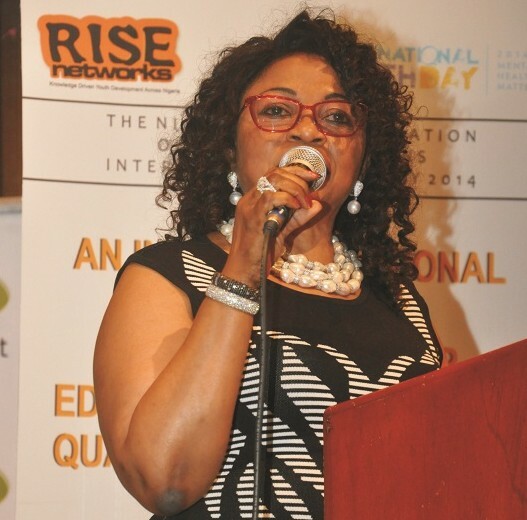 KEYNOTE SPEECH delivered by Forbes rated Africa’s richest woman and MD/CEO of Famfa Oil, MRS FOLORUNSO ALAKIJA titled ‘INSPIRING YOUTH ON ENTREPRENEURSHIP’: “Youth on Entrepreneurship for Entrepreneurial Positive Impact’ at the NIGERIAN COMMEMORATION OF THE UNITED NATIONS INTERNATIONAL YOUTH DAY 2014 Event organised by RISE NETWORKS.